Launched into the UK professional skincare market in 2016, AlumierMD aims to help everyone attain the clear and beautiful skin that they desire. A team of experienced PhD biochemists, physicians and skin care specialists, with a combined experience of over 100 years, have created effective formulations containing the correct percentages of the highest-grade active ingredients, as proven by clinical studies. Products can be used on all Fitzpatrick skin types (I-IV), to tackle a multitude of skin concerns, providing you with progressively more youthful and glowing skin. The brand name is based on the word ‘illuminate’ meaning ‘to make clear or bright’. Their range includes cleansers, moisturisers, antioxidant serums, exfoliators, eye creams, sunscreens, a neck and décolleté cream and chemical peels; products being for both in-clinic and home use. AlumierMD is proud to be an eco-friendly skincare brand. All their packaging is recyclable, and no products are covered in cellophane. Their exfoliating agents are biodegradable, and all ingredients are sustainable. Furthermore, none of their products are tested on animals. All of AlumierMD`s products contain clinically-proven ingredients at optimal concentrations, including encapsulated retinol, hinokitiol, L-ascorbic acid (vitamin C), sea whip, oyster phoenix mushroom, oligopeptide-10, encapsulated salicylic acid, matrixyl synthe’6, glutathione, gluconolactone and haloxyl. They do not add any extras into their products; stating that if it doesn`t have a proven therapeutic effect, it doesn`t go in. Furthermore, they are kinder to the skin, as they contain no artificial scents or perfumes. The products also do not contain chemical preservatives such as parabens. – Reducing the signs of ageing. 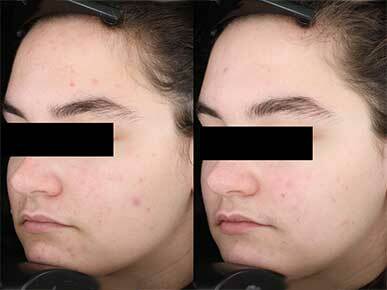 – Hyperpigmentation (dark patches on the skin). – Acne and related issues, including large pores and oily skin. – Dry and uneven skin. AlumierMD products are only available through approved skincare specialists, medical professionals and aestheticians. It is important that you undergo a consultation with your trained specialist, so they can determine which products are best for your skin. Their range includes antioxidants, moisturisers, cleansers, exfoliators, serums, eye and neck creams, sunscreens, and in-clinic chemical peels. The AlumierMD range can be used on all Fitzpatrick skin types (I-IV). Those who are pregnant or breastfeeding, or those with any underlying medical conditions, should consult with their general practitioner (GP) before undergoing any treatment from AlumierMD. You will notice an improvement in your skin after a few weeks of following your specially designed skincare regime. The duration of the effects will last for as long as the products are used, but it is important to note, that although some reduce the signs of ageing, they do not stop the ageing process. A single chemical peel can provide an immediate effect to brighten skin; however, for optimal and more significant results when treating complexion concerns, including fine lines, skin texture and acne, it is recommended to have multiple peels, as advised by your specialist. Visible results with significant improvement should be seen after approximately eight weeks. Side effects and reactions are rare with AlumierMD products, so you are advised to contact your skincare specialist if you experience any unexpected reaction during use. You may experience mild redness, irritation and peeling when using the retinol based products (Retinol Resurfacing Serum 0.25. 0.5 & 1.0). It is recommended to acclimatise the skin to this ingredient, by starting with a low percentage retinol product first, and increasing from every couple of days to daily use. The retinol based products in AlumierMD use a microencapsulated technology which is designed to offer a slow release of the retinol into the skin to minimise any irritation, but preconditioning is still advised, especially for the 1.0 concentration. – 82% agreed that AlumierMD treatment penetrated and cleaned pores. – 76% reported softer and smoother skin. – 71% noticed a reduction in excess shine and oil. – 65% felt their skin tone was more even and acne blemishes were reduced. 56% of trial participants rated the tested products as a performing anti-acne skincare line.